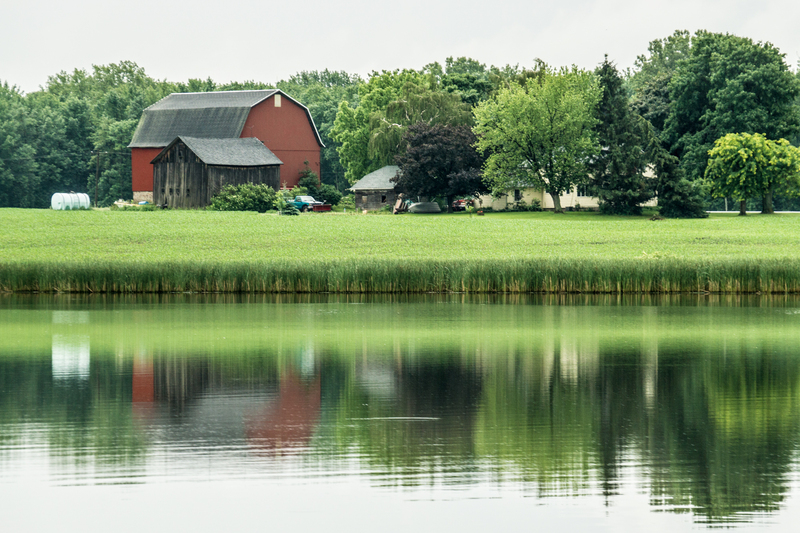 We picked up our boat at Mid-Lakes Navigation near Macedon, NY and headed toward Fairport in rain so hard we had to stop and anchor. Fairport was our first lovely surprise and a nice place to spend our first night. Since the town evolved with the Canal, there were no engineers to make sensible decisions. 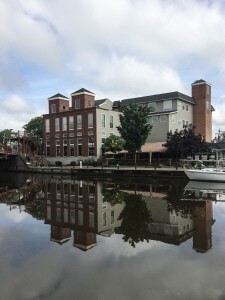 The Canal was crossed by a number of bridges; the Fairport Lift Bridge, pictured below, was built on a slant and a diagonal because the roads on either side weren’t opposite each other and no one wanted to relocate the roads. Bridges across the canal were nearly universally built as lift bridges – a span set between two stone and concrete bases that was lifted by strong cables and counterweights and designed to accommodate the limited height of the largest canal boats. Boats constructed too tall for the bridges were designed to collapse and get shorter when coming to a town. There were, literally, inches of clearance between the tops of the boats and the bottom of the bridges, leading unfortunately to some serious accidents over the years. 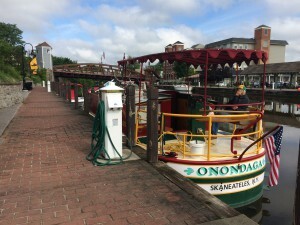 Onondaga at “home” in Fairport on June 12. The bridge in the background actually slants. 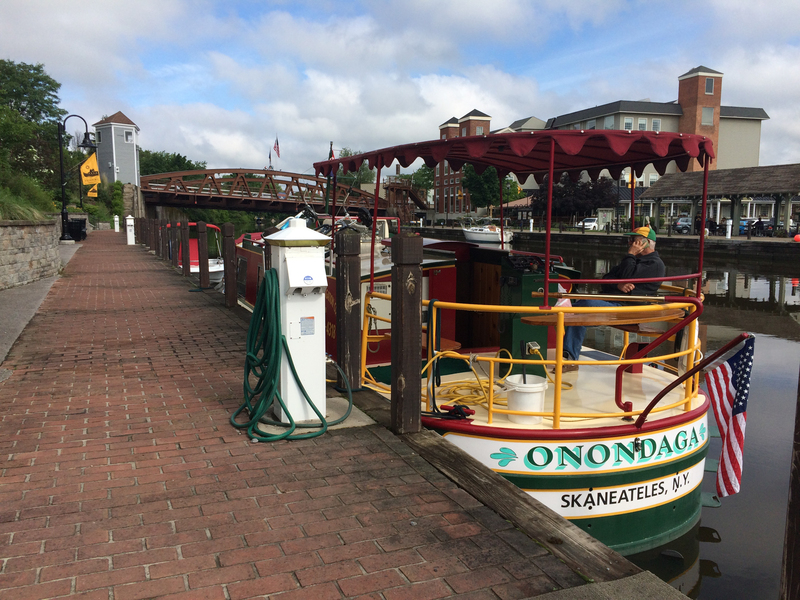 Fairport, and every town we visited, provided free dockage. Most had free electricity, free water, and a free visit to the antique buildings, roads, and life of years ago. The towns stopped growing the day the railroad opened. 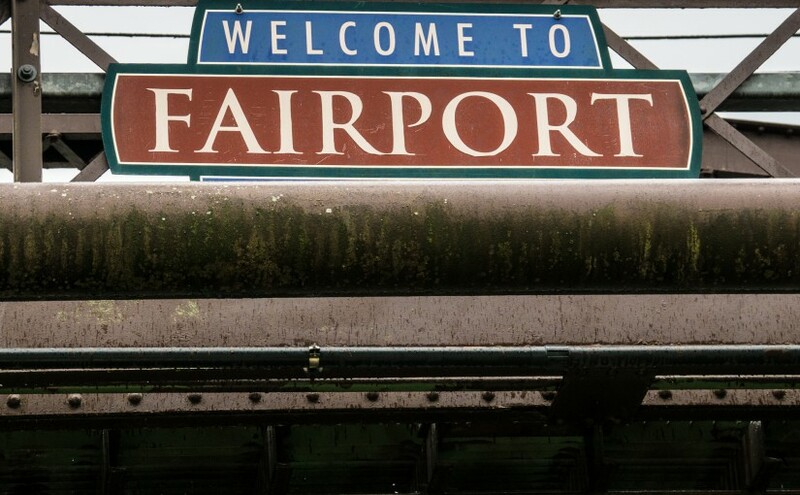 Unfortunately for Fairport, the railroad is right next to the docks, making the town dock unendurable for several minutes every hour as the train whistled through. 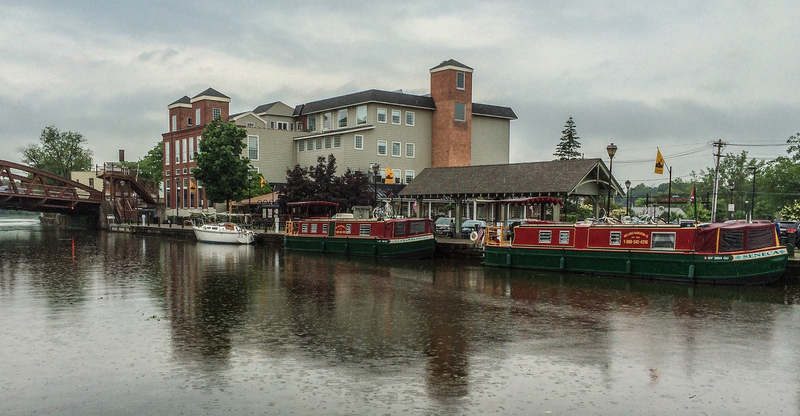 Life in these towns centered on tourists, and tourists centered on the waterfront. Fine places to eat with good, often inexpensive, food and terrific surroundings. There was always some music in the air. People were friendly. Boaters were especially friendly. As we docked, there were always waves, often clapping when we expertly approached the docked, stopped at exactly the right spot, and Joan smoothly tied the bow line to a waiting cleat. I’d like to think we were an expert crew, but truth is the boats were very easy to handle and were all steel, making them impossible to dent and nearly impossible to scratch. We did, however, enjoy the applause and saw many dockings that would have benefitted from a much slower approach to the dock.